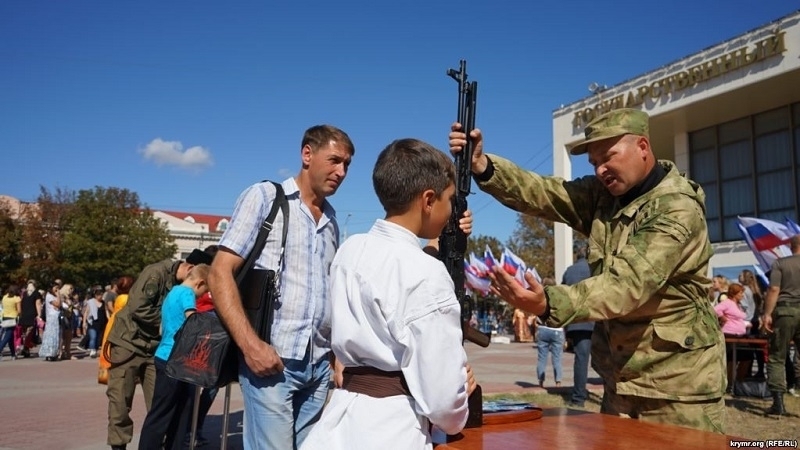 On the occasion of celebrating the "Day of the State Emblem and the State Flag of the Crimea" in Simferopol, children were taught to handle weapons. The occupation authorities of the Crimea celebrated the Day of Flag with mass festivities, including master classes for children in the assembly and disassembly of weapons. On September 24, the Day of the State Emblem and the National Flag of the Crimea is celebrated on the peninsula. This year, the organizers did not confine themselves to festive processions and performances by amateur groups. On Lenin's Square in Simferopol, special training points were organized where members of the so-called "self-defense of the Crimea" taught children to assemble and disassemble weapons, as well as to fill the magazine cases with cartridges. Moreover, during the festive events, the booklets were distributed describing the Crimean coat of arms, the flag and the text of the hymn - on the initiative of the Ministry of Information Policies of Crimea, controlled by Russia. They also recalled the "glorious Soviet past": Children and adults who complied with GTO standards (Ready for Labour and Defence of the USSR) were given badges and certificates. It should be noted, that the Flag Day in the occupied Crimea is celebrated on September 24 for the second time. The parliament under the control of Russia passed a relevant law in 2015. Earlier it was reported that the second issue of the newspaper in the Ukrainian language had been published in the Crimea.